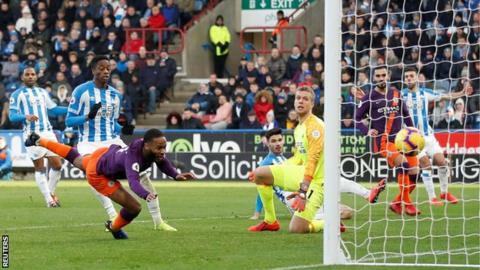 City, who had netted 19 goals in their past three games, were not at their free-scoring best in the first half at the John Smith’s Stadium. But the defending champions went ahead in the 18th minute when Danilo’s long-range effort deflected in off the head of Christopher Schindler. First, the Germany forward whipped in a cross for Raheem Sterling to dive and head in his 12th goal of the season. Then Sergio Aguero cushioned a header for Sane to run on to and finish past Jonas Lossl. It was not a vintage display by Pep Guardiola’s side but they remain in title contention. City should have been awarded a penalty in the 13th minute when Terence Kongolo went into the back of Sterling. Danilo’s goal lifted a sloppy first half during which even Kevin de Bruyne, usually so assured in possession, was wasteful. Bar the two-goal burst, the visitors were nowhere near their attacking best, even when the two Silvas – Bernardo and David – came on in the second half. Aguero barely threatened and only managed one shot, a half chance in the first half. “The way we played we didn’t deserve more than three goals,” said Guardiola. “We will improve in the future. “What we have done so far has been incredible, in the league and the Carabao Cup. We have an incredible number of points. But this game can teach us and show what we have to do to improve. “We’ve scored a lot of goals. So far, so good. One team has been better but we’re in January and there’s many more games to play. We have to focus on what we have to do. Former Monaco striker Adama Diakhaby started up top but he is yet to score this term, while on-loan Montpellier forward Isaac Mbenza is also goalless. City keeper Ederson made just two saves, one in each half. Match ends, Huddersfield Town 0, Manchester City 3. Second Half ends, Huddersfield Town 0, Manchester City 3. Attempt missed. Steve Mounie (Huddersfield Town) right footed shot from very close range misses to the right. Attempt saved. Bernardo Silva (Manchester City) right footed shot from the centre of the box is saved in the centre of the goal. Assisted by David Silva. Attempt saved. Steve Mounie (Huddersfield Town) header from the centre of the box is saved in the centre of the goal. Assisted by Alex Pritchard with a cross. Substitution, Manchester City. Fabian Delph replaces Ilkay Gündogan. Attempt missed. Steve Mounie (Huddersfield Town) right footed shot from outside the box is close, but misses to the right. Assisted by Isaac Mbenza. Attempt missed. Danilo (Manchester City) right footed shot from outside the box is too high. Assisted by Kevin De Bruyne. Substitution, Huddersfield Town. Alex Pritchard replaces Juninho Bacuna. Substitution, Huddersfield Town. Steve Mounie replaces Adama Diakhaby. Attempt missed. Kevin De Bruyne (Manchester City) header from the centre of the box is high and wide to the left. Assisted by Danilo with a cross. Goal! 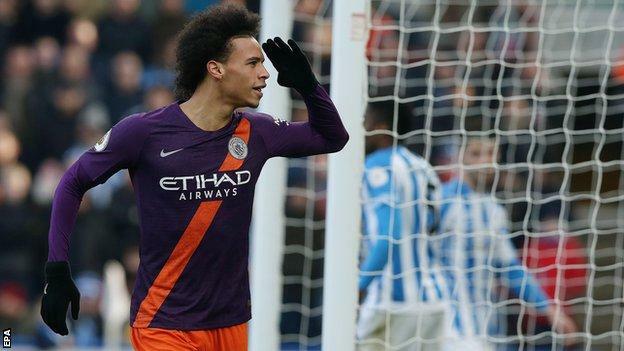 Huddersfield Town 0, Manchester City 3. Leroy Sané (Manchester City) left footed shot from the centre of the box to the bottom left corner. Assisted by Sergio Agüero with a headed pass. Goal! Huddersfield Town 0, Manchester City 2. Raheem Sterling (Manchester City) header from very close range to the bottom right corner. Assisted by Leroy Sané with a cross. Second Half begins Huddersfield Town 0, Manchester City 1. First Half ends, Huddersfield Town 0, Manchester City 1. Offside, Huddersfield Town. Adama Diakhaby tries a through ball, but Elias Kachunga is caught offside. Attempt missed. Ilkay Gündogan (Manchester City) right footed shot from the right side of the box misses to the right. Assisted by Kyle Walker.